WAILUKU — The Maui High School football team had a plan and executed it to near perfection on its homecoming night Saturday at War Memorial Stadium. The Sabers used a wildcat formation with several different running backs for the majority of the game and combined that with a defense that delivered five turnovers and a safety, all of which added up to a 32-21 victory over Baldwin — Maui High’s fourth over the Bears since 2001, and first in the teams’ last five meetings. 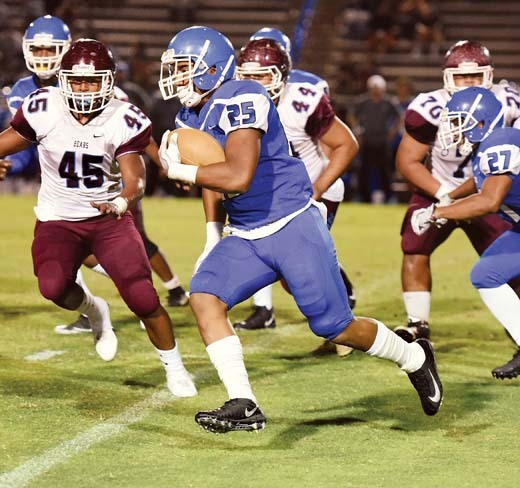 The win gave the Maui Interscho­las­tic League Division I first-round crown to the Sabers (2-2), while Baldwin (2-2) lost for the fourth time in six games overall this year. 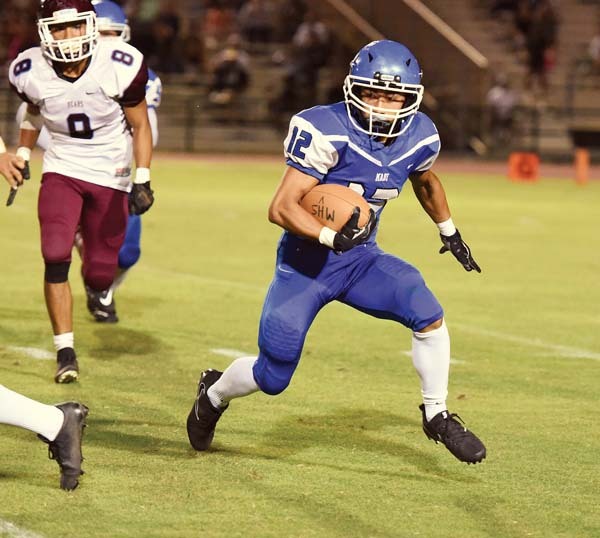 Sophomore running back Solo­mone Tongi ran from the quarterback spot on the first seven plays for the Sabers, and finished with 153 rushing yards and two touchdowns. 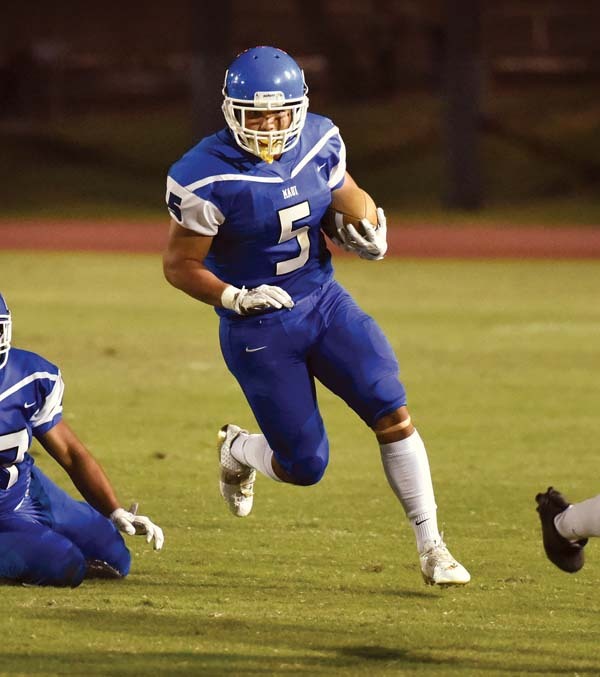 Naia Nakamoto also ran for two touchdowns for Maui High. His first, on a 46-yard run on the first play of the second quarter, put the Sabers in front 13-8, and they led the rest of the way. That touchdown was set up when the Bears fumbled a handoff between quarterback Chayce Akaka and Aloalii Laga at the Sabers’ 39-yard line. Akaka passed for a touchdown and scored on a run and a catch, but threw three interceptions in a game for the first time in his high school career. The Bears scored on their first possession when Akaka scrambled into the end zone from 11 yards out, and Bishop Wickes, who had six carries on the drive for 44 yards, took the snap on the conversion attempt and ran straight up the middle for an 8-0 lead. Tongi’s 2-yard touchdown run made it 8-6 with 2 minutes, 27 seconds remaining in the first quarter. 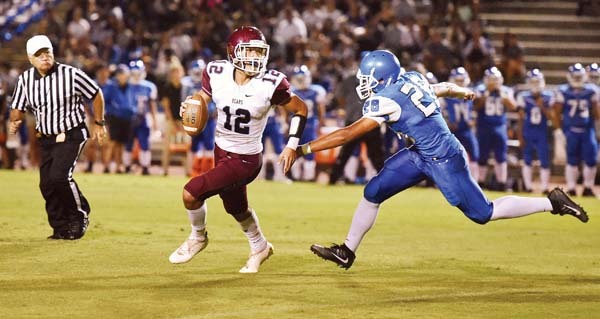 In the third quarter, the Sabers’ only completion of the game, a 50-yard strike from Kainalu Tancayo to Mitchell Hirose, was followed by Naka­moto’s 13-yard touchdown after taking the wildcat snap that made the score 20-8. Kevin Cacho intercepted Akaka three plays later to thwart another Baldwin opportunity, and Maui High would push the lead to 27-8 when Tongi broke free for a 50-yard touchdown run. 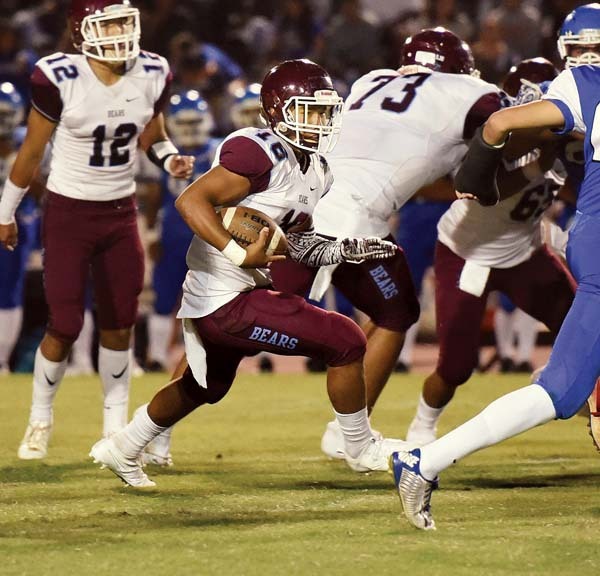 The Bears then reached Maui High territory again, but Tevita Takitaki intercepted Akaka on the final play of the third quarter. Falekaono intercepted an Akaka pass earlier in the period after the Bears had advanced to the Sabers’ 26. Akaka, in his third varsity season, entered the game with 41 touchdown throws and seven interceptions in MIL play. Akaka’s 26-yard touchdown pass to Kaikea Silva made the score 27-15 before the Sabers’ defense put an exclamation point on its evening — Fale­ka­ono hit receiver Anstin Duarte deep in Baldwin territory and the ball bounced back into the end zone, where the Bears fell on it for a safety with 5:02 left. Honu Feldt-Antonio kicked a 30-yard field goal for Maui High before Akaka caught a 24-yard touchdown pass from Isaiah Kusunoki with 35 seconds to go. Falekaono recovered a fumble caused by Storm Crozier’s hit on Kusunoki in the second quarter. B–Chayce Akaka 11 run (Bishop Wickes run), 6:49. MH–Solomone Tongi 2 run (run failed), 2:27. MH–Naia Nakamoto 46 run (Kalia Kapisi kick), 11:50. MH–Nakamoto 13 run (Kapisi kick), 7:02. MH–Tongi 50 run (Kapisi kick), 0:41. B–Kaikea Silva 26 pass from Akaka (Akaka kick), 8:11. MH–Safety, Baldwin recovers own fumble in end zone, 5:02. MH–FG Honu Feldt-Antonio 30, 1:13. 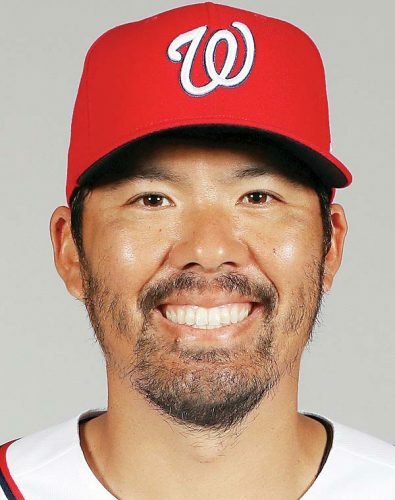 B–Akaka 24 pass from Isaiah Kusunoki (pass failed), 0:35. Junior varsity–Baldwin 29, Maui High 0. LL–Joshua Tihada 1 run (Pablo Rico kick), 7:26. LL–William Kai Bookland 17 from Etuati Storer (kick failed), 1:45. KSM–Tyerell Baldonado-Kaleiopu 80 pass from Kainoa Sanchez (Michael Singh kick), 1:29. LL–Elijah Ragudo 35 run (run failed), 11:51. LL–Storer 11 run (pass failed), 6:55. KSM–Nathan Facuri 69 pass from Sanchez (kick blocked), 5:08. LL–Tihada 10 run (Rico kick), 11:55. LL–Aliksa Pihda 13 pass from Nainoa Irish (Rico kick), 5:10. 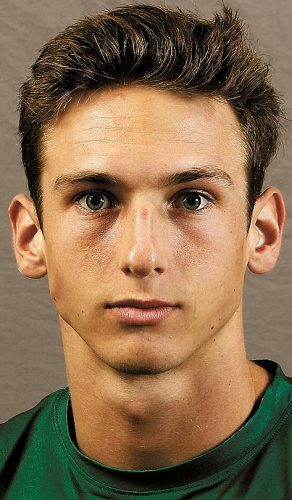 KSM–Facuri 4 pass from Sanchez (pass failed), 0:41. Junior varsity–Lahainaluna 28, Kamehameha Maui 6. RUSHING–Lahainaluna, Ragudo 15-180, Tihada 17-109, Irish 4-50, Pihda 6-33, Storer 6-26; Kamehameha Maui, Sanchez 17-77, Damon Martin 8-27, Dane Abarra 3-7. 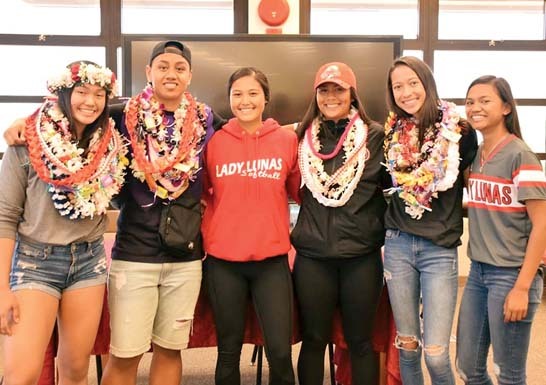 PASSING–Lahainaluna, Storer 1-1-0-17, Irish 1-1-0-13; Kamehameha Maui, Sanchez 14-15-0-244. RECEIVING–Lahainaluna, Bookland 1-17, Pihda 1-13; Kamehameha Maui, Baldonado-Kaleiopu 6-118, Facuri 5-94, Karsyn Pupunu 3-32. MISSED FIELD GOALS–Lahainaluna, Rico 35 (SH).